Why Are Consumers Turning to High-Protein Foods? 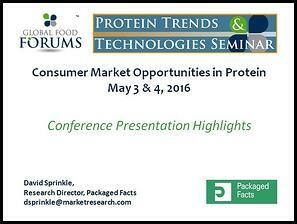 "Consumer Market Opportunities in Protein," will help you identify why consumers are turning to high-protein foods. It also covers the ingredient issues consumers believe are most important to them when choosing what foods to eat. Fill out the form to gain valuable information on consumer demand of high-protein and plant protein foods.